Adrafinil is a nootropic agent that increases attention in healthy adults. Adrafinil is a prodrug for modafinil, meaning it is metabolized into modafinil and thus carries many of the same physiological and cognitive effects as modafinil. It is similar in structure to modafinil, without the terminal amide hydroxyl group. Adrafinil is a prodrug for modafinil. 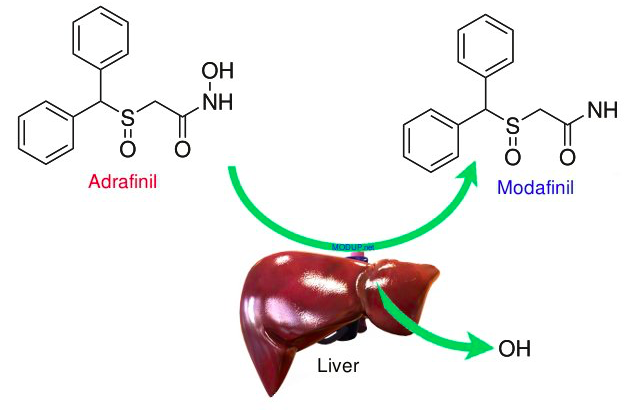 It is converted to modafinil in the liver. While there are few studies directly studying the effect of adrafinil on cognition, there is a large body of research involving the effects of modafinil on cognition, particularly with respect to attention.4,5,6,7,8Some studies have observed improvements in creativity9and mood10as well. As with modafinil, it is important to note that there are various side effects associated with adrafinil usage and withdrawal. Adrafinil is a synthetic compound. It can be obtained either over the counter or with a prescription. Adrafinil cannot be obtained through natural food sources. While modafinil has been studied extensively, its prodrug adrafinil lacks a similar robust body of research. It is important to note that adrafinil and modafinil are not classified as a Generally Regarded as Safe (GRAS) compound by the FDA. Individuals choosing to consume adrafinil and modafinil should do so at their own risk, with special regard to the non-trivial withdrawal effects. Milgram, N. W., Callahan, H., & Siwak, C. (1999). Adrafinil: a novel vigilance promoting agent. CNS Drug Reviews, 5(3), 193-212. Saletu, B., Grünberger, J., Linzmayer, L., & Stöhr, H. (1986). Pharmaco-EEG, psychometric and plasma level studies with two novel alpha-adrenergic stimulants CRL 40476 and 40028 (adrafinil) in elderlies. New Trends in Experimental & Clinical Psychiatry. Klimesch, W. (1999). EEG alpha and theta oscillations reflect cognitive and memory performance: a review and analysis. Brain research reviews, 29(2), 169-195.